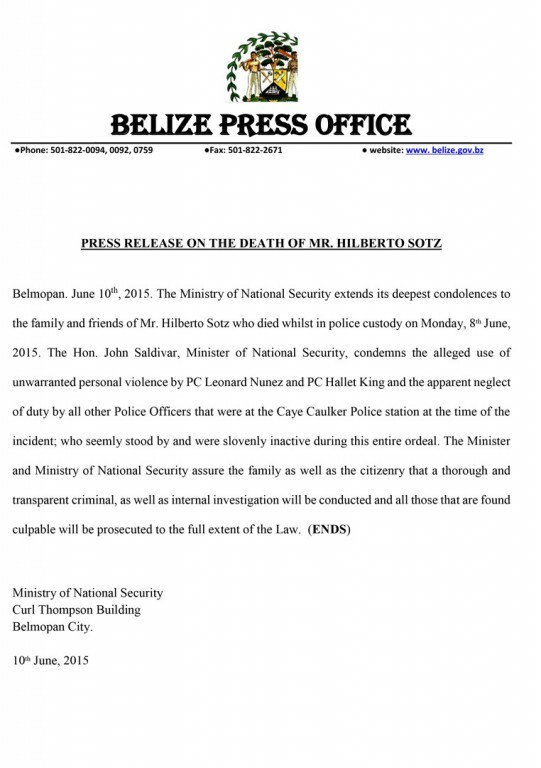 Press Release - Commissioner of Police - Wednesday June 10, 2015 - The Commissioner of Police wishes to update the family of the late Hilberto Sotz and the citizenry on the outcome of both criminal and internal investigation conducted in this rather unfortunate incident that occurred on Monday June 8, 2015 in Caye Caulker Village. At the conclusion of the criminal investigation and the result of the post mortem examination conducted which certified cause of death to be “Vascular shock pronounced massive heart thrombosis acute post traumatic cerebral edema as a result of trauma to the head and body, on Wednesday, June 10 at 3:40 pm, Leonard Nunez police constable # 628 and Hallet King police constable # 819 both attached to Caye Caulker police sub-formation were arrested and charged jointly for murder and arraigned before Chief Magistrate Ann Marie Smith and remanded into custody until July 14, 2015. Both PCs Nunez and King, who were charged criminally, have also been charged disciplinary. The Commissioner of Police and the Belize Police department stand by its commitment in maintaining a zero tolerance on abuse of person’s rights as well as any acts of wrong doing by its officers. A plan of action has been developed where effective immediately, Caye Cauller Village will be commanded by a senior officer in the person of Inspector Dehanne Augustine and supported by a senior Non-Commissioned Officer, Sergeant Norman Benguche. Officers have been identified and will be deployed to replace those on interdiction to ensure continuous policing services are provided.